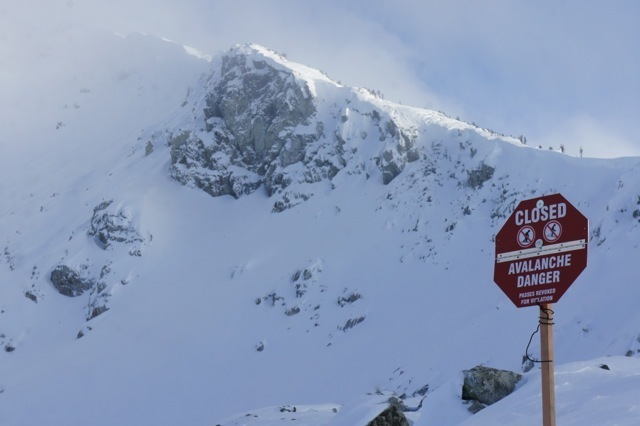 Avalanche closure in effect yesterday on Blackcomb, please be sure not to cross any sign lines. Read the sign, it could save your winter. At 2260 meters as of 07:00 the temperature was -6 . Winds were 15-20 KPH from the SSE. In the valley it was 0. 8 cm of new snow was recorded at Pig Alley last night. Possible flurries today as the westerly flow slowly gives way to a high pressure ridge building by tomorrow. No snow until at least Wednesday evening. Enjoy the sun for a few days. Yesterday when the storm went through there was evidence of size 2 natural avalanches releasing. I went out for a tour yesterday, hoped to get more data but unfortunately (other than the great ski out) the weather clagged in and we had to bounce. Here are some notes from the top of my head, as we recoded it all to voice memo and then technology defeated us with a phone battery failure! 121122 - Quick pit obs from 2246m NE aspect on glacier. Depth 180cm Air T-7.5c, surface T-7.5c. Wind mod from South, blowing snow. Probed 240cm depth on glacier, likely to ice, maybe firm snow. One down 20 (now buried 50) poorly bonded new fist snow, great for skiing. Reacted ctm12. We also ski cut this and it runs fast. It also had a wind skin on it in places, something to keep in mind now that there is an additional 25cm+ loaded on it. The third is the nov 4th interface. It is a facetting rain crust, with well developed facets, looking like they are trying very hard to round out. Got it to fail PC on cth29. If this layer reacts, it's game over. Weak temp gradient to nov4th interface. Unsupported features were, as somewhat expected from previous obs, the most reactive. Ski quality is great-excellent. The low temps and leaving us with, dare I say, blower snow. 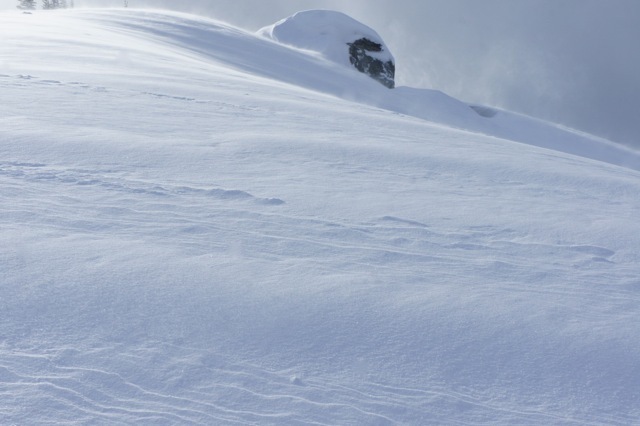 There is acceptable early season coverage so access to some great turns exists. Surfs up, Double Rubble and Sapphire looked bone dry. 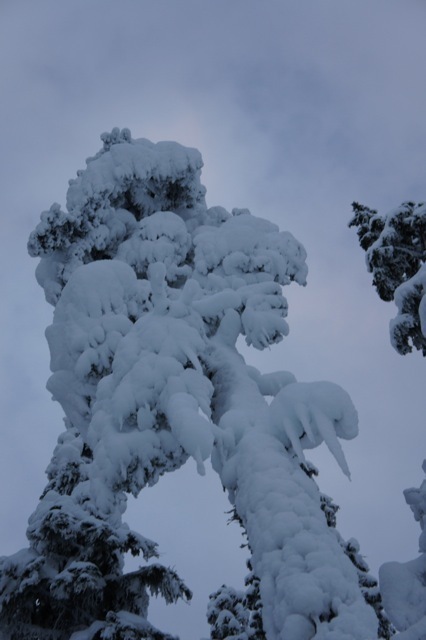 Lots of Blowing snow all over the glacier, looked like some windslab NA's on husume, however vis was too poor to tell. Rescue road still has water crossings. Saw some of the lads coming out of Ruby, they said Spanky's shoulder was great skiing and great base grinding. Winds in the alpine yesterday gusted up to 80KPH, in this location at 1870 meters there was a 3-5 cm soft wind slab forming. These tree bombs would not be nice! !